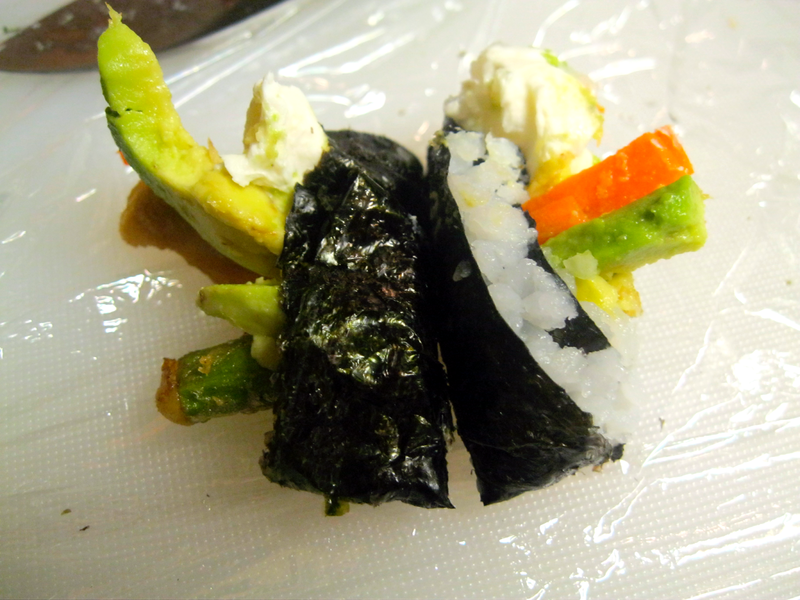 I finally did it - I made sushi. Well some people might not consider it "real" sushi as it doesn't contain any raw fish, actually it doesn't contain any fish. But I'm calling it, it's SUSHI. It was actually super easy! A little time consuming, but simple and really fun. 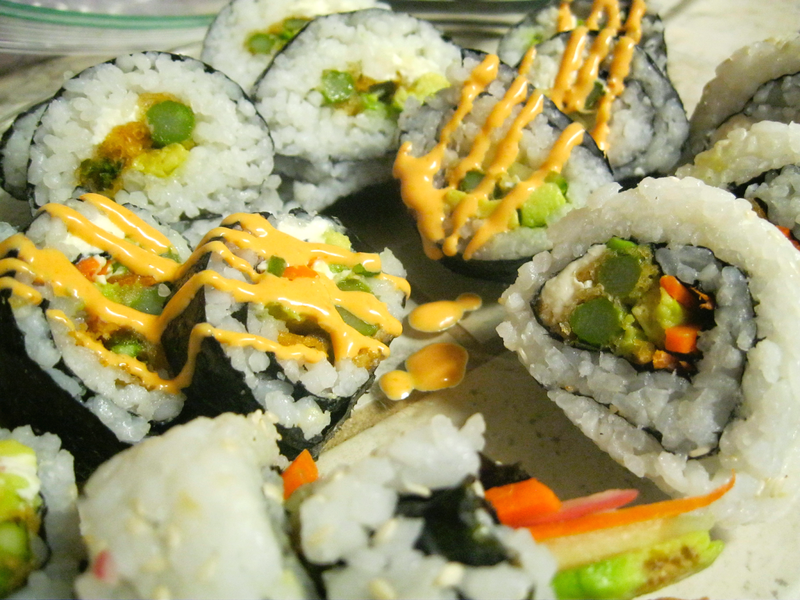 If you like sushi, I suggest you try to make it. Recipe download is at the bottom. I bought one a while ago. You'll see it in the photo below. It's a small bamboo mat that helps form the roll before you cut it. It came with the nifty wooden spoon that in the rice bowl. They're actually really inexpensive and you can find them nearly anywhere on the internet. I'm pretty sure mine was an Amazon find. 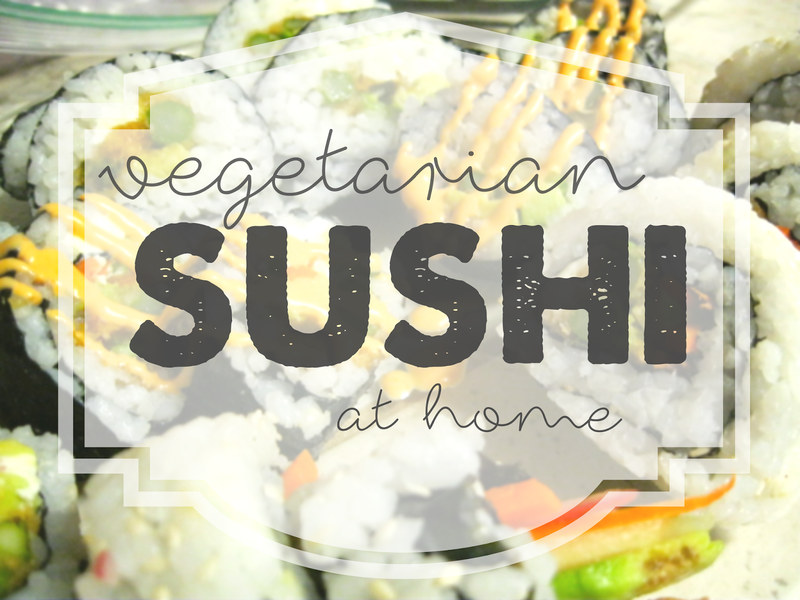 Anyway, it's pretty much a necessity so if you want sushi at home you gotta buy one ( get it for $6 here). It's a short grain rice. I honestly have no idea if it is different than other rices. I asked one of my regular sushi places one time and they said they used regular long grain rice but then I've heard some people exclusively use and suggest using real sushi rice. So far I've used sushi rice. The first time I bought it I paid WAY too much for it, the next time I found some in the bulk section at Winco for a pretty reasonable price. I got some by Stash brand - yeah, the tea company. weird huh? The package said "For Sushi" on the front of it. I've heard of people using rice paper instead of nori and it actually is possible to make successful sushi rolls without it but your rice has to be the perfect consistency. 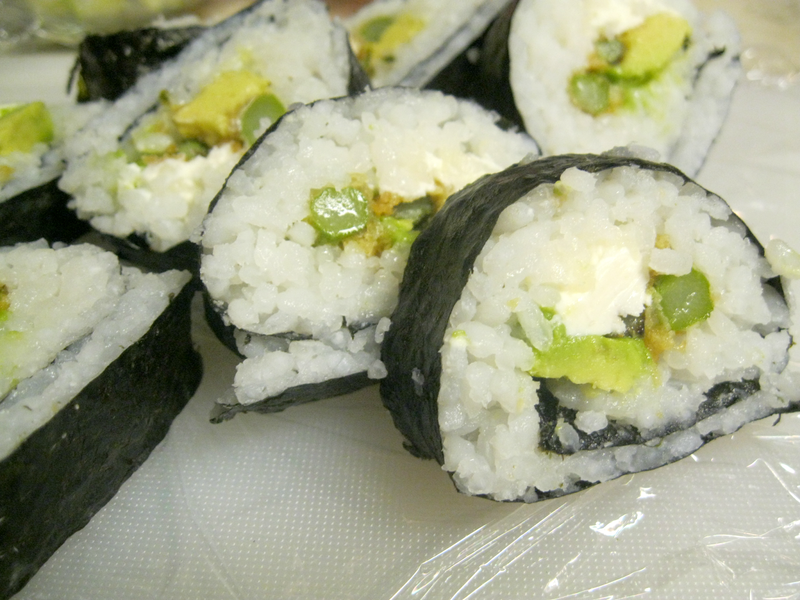 When I tried making rolls without nori I failed far more times than I succeeded. If you haven't made sushi, I suggest you use nori. You can find it on the internet, at an Asian Market, or in the Asian section of most national grocery stores. This is for making the sushi rice sticky - you'll see. But you need it and you can find it at pretty much any grocery store either with the vinegar or, again, in the Asian section. I love this stuff (you can also make Vietnamese Pickled Veggies with it, so good! but that's another post). Does the rest of the world use these for anything? I love them, I know that. I also love sesame oil but what do you do with it? 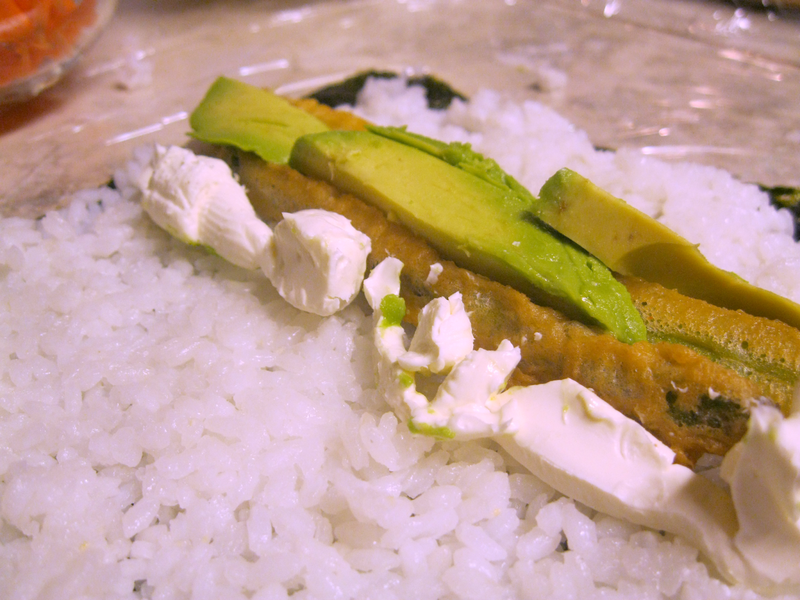 Anyway, if you are going to make 'inside-out sushi' (that's probably not what it's called) you'll need them to make it so the rice on the outside isn't as sticky. For making spicy mayo. Or for dipping sushi pieces in. Maybe everyone should just have this stuff in their fridge. I bet you have some of this stuff. I like the 'less sodium' stuff, I mean why not? Put whatever you want inside your sushi - really almost anything. Carrots, Cucumbers, Radish, Daikon (a mild radish - Vietnamese I think), and Avocado. Tempura Asparagus (poorly tempura-ed I might add, it got better the next time) and pickled onions. Yup. They're great, if you haven't tried them DO IT. Cream Cheese, Spicy Mayo, and Sesame Seeds. I used Alton Brown's Recipe - Here - I love him. It's 5 ingredients and is super easy. 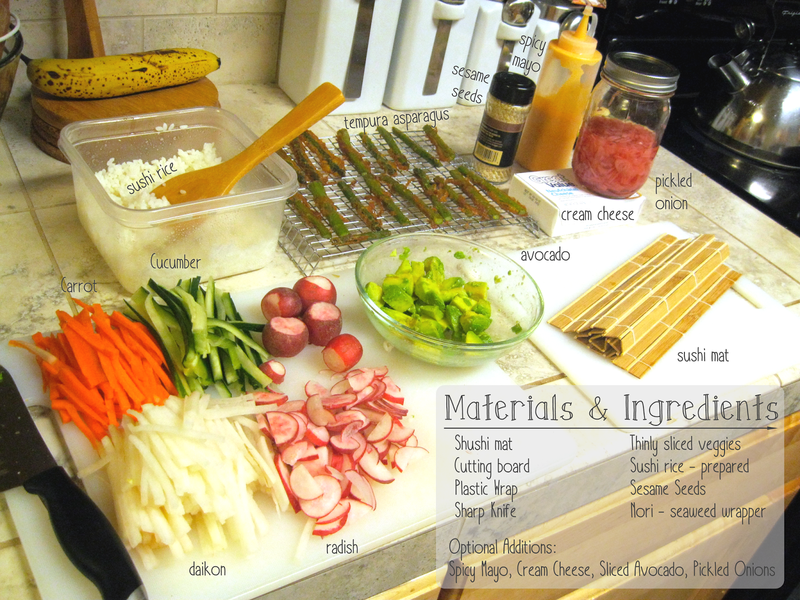 You'll need both the cutting board and the sushi mat covered with plastic wrap. This keeps things from getting really messy. Lay the mat so you can roll it away form you, like you are rolling a burrito, and put a nori sheet on top of it. Wet you hands with warm water and grab a handful of rice and press it into an even layer making sure going clear up to the edges. It took me a couple of handfuls to cover the sheet completely. The rice in the photo below is way too thick, just for a reference. 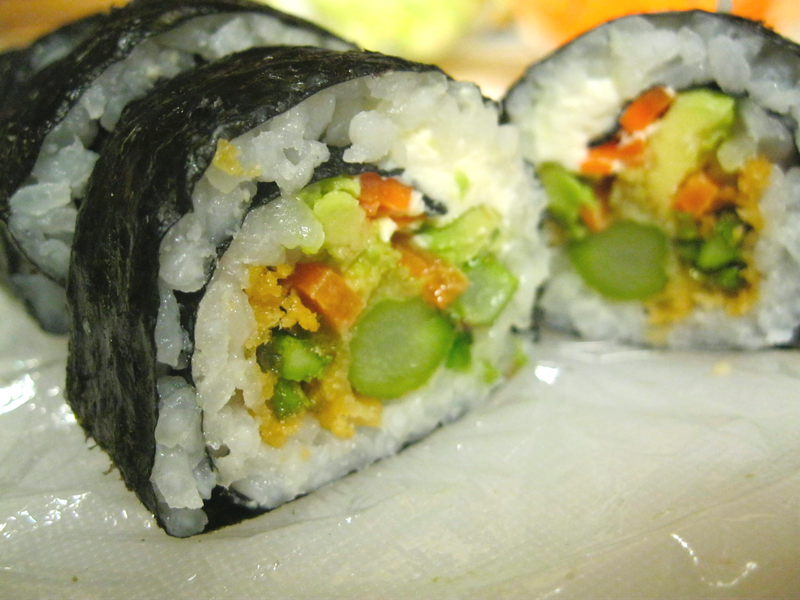 Fill the roll by laying the stuffings in a thin row a couple inches from the end of the nori sheet. Once filled begin to roll it by lifting the edge of the sushi mat and wrapping the short end over the top of the stuffing and just roll. The best way to figure out how to this part is to watch a video and practice. This video is pretty good, but there are plenty out there. Pretty dang good, if I do say so myself. But here's what the ends looked when I tried to cut the last piece... not so good. Making these was actually really fun and surprisingly easy once you get everything prepared. And they turned out beautifully - do you agree? The rice I prepared made quite a few rolls, so what we didn't eat I just stored in a plastic airtight container and it was still really good over the next couple days. In fact the next time I made sushi it was with my sister and we took some up with us to my grandparents house and they both loved it! Which I was incredibly excited about because I wasn't sure I was even going to be able to get them to try it. This stuff is surprisingly portable as well. My fiance and I were taking some on a hike/picnic, however we sadly didn't get to enjoy them because once we got onto the trail I promptly fell and broke my ankle. So inevitably we didn't get to finish our hike or enjoy the sushi - we did later though, swollen throbbing ankle and all. Since it's really personal choice I made a semi-vague recipe to work from like a guide.